This time of the year is always crazy in our house. My youngest son turned 4 last week and between school, cooking and gift buying my time is very limited. I seem to always be running out of time and money. Since I bake a lot during the holidays I also try to make sure that my dinners stay at least somewhat healthy. Plus then I can let myself have more holidays cookies, right? I make a lot of chicken throughout the year. It is a great lower fat option and can be delicious in so many recipes. However, chicken can also get a little boring. I try to add in turkey and other poultry to keep my family's taste buds interested. This week I tried a new recipe for Spicy Turkey and Green Bean Stir-Fry from the December issue of the Food Network Magazine, which looked quick, low in fat, and filling. This recipe has 12 ingredients. It takes 30 minutes of total time, all of which is active and makes 4 servings. I did make a number of changes. First, I have never seen 99 percent lean ground turkey in my area. The only types normally available are 85, 95 and 97 percent. So I bought the 85 percent lean ground turkey. Since my turkey was higher in fat I did not fry it in as much vegetable oil. Plus I drained my ground turkey after it was done browning. I eat gluten free so I used gluten free soy sauce. Always read your labels, since wheat is a top ingredient in many low priced soy sauces. After tasting the recipe as written, I changed a few things. First I doubled the amount of chile paste, soy sauce and added three garlic cloves instead of one. I also served it over brown rice instead of white rice. I stopped serving white rice about 6 months ago and now my two boys prefer brown rice. I followed the remainder of the recipe as written. After all the changes this recipe worked much better. As the recipe was written it lacked flavor, but after an increase of the chile paste, soy sauce and garlic the taste worked. Finely grated fresh ginger would be another great addition to the flavor in this recipe. I always use magazine recipes as a starting point to making a better recipe. This is an example of a recipe that with a few changes works out well. 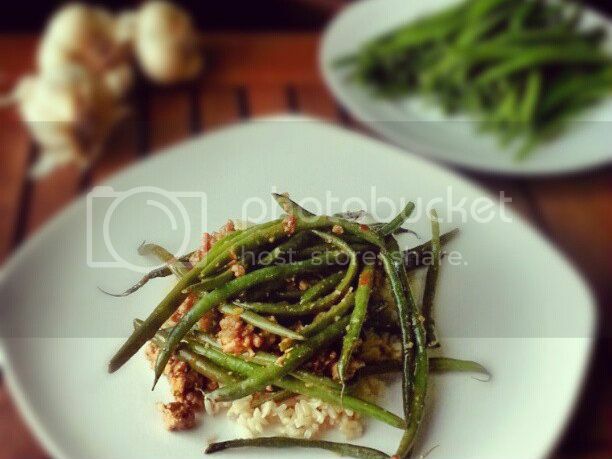 For the recipe go to Spicy Turkey and Green Bean Stir-Fry. This sounds delicious! Might just have to try this... now I need some turkey! Returning the follow from Going with the Flow! It really was good and so easy :) Thanks for following back!